1. Glue 3 ammonite slabs (or other cabochons) onto ultra-suede. Bead embroider around the slabs, adding seed beads, freshwater pearls, and coin pearls. 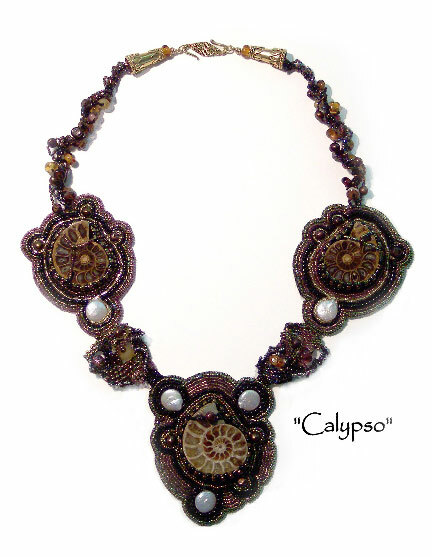 I used many vintage seed beads in this piece, including rare French cut steels, but easily available Delicas can be substituted. The instructions for stitching back stitch and stack stitch, used here are in the free first chapter of my e-book, Every Bead Has a Story. 2. Back the embroidered pieces with another piece of ultra-suede to hide the stitching, and stitch beads all the way around each piece to cover the raw edges. I used edging brick stitch, which is also taught in the free chapter linked above. 3. Create 2 freeform peyote pieces with seed beads, pearls, and lampworked beads (I used my own), which are stitched to the embroidered pieces in order to join them. 4. Free form beadweave a collection of coordinating lampworked beads, pearls, and seed beads from the top edges of the embroidered pieces up to 2 pieces of looped gold wire. When the strands are completed, insert the wires through gold or vermeil cones and finish off with a clasp.